Some say satay has Turkish roots due to its similarities to shish kebab but some say it began with Chinese immigrants selling it on the streets. 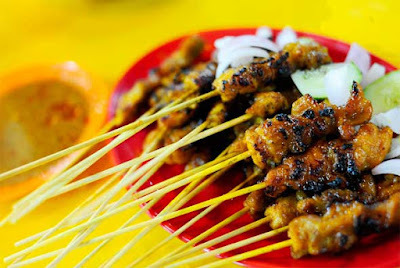 Whatever its origins, satay is almost synonymous with Malay cuisine. 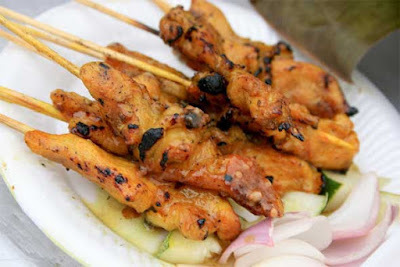 Satay is usually marinated beef, chicken or mutton in slightly larger than bite size pieces skewered on thin bamboo sticks, then barbequed over a charcoal flame. The hawker flips it every now, basting it with oil and fanning the flame to ensure even cooking. It is accompanied with a slightly spicy-sweet peanut sauce, One can continously-eat the satay, and before realising it, will have eaten a fair ten to twenty sticks. Almost every culture in this world has some sort of meat on a stick in their cuisine repertoire. We have Yakitori from the Japanese, Mititei from the Romans, Espetada from the Portuguese, Frigarui from the Romans, and the more common one which is Kebab from the Turkish, Iranian, Pakistani, Indian and Africans while another infamous one is satay from the Malaysian, Indonesian, Singaporeans, Philippines and Thais. The meat on stick in Malaysia called satay is famous for the thin enough sliced spiced meat twisted around a ‘lidi’ (fine stick in middle of coconut leaves) that is just the right length, and then barbecued to perfection. 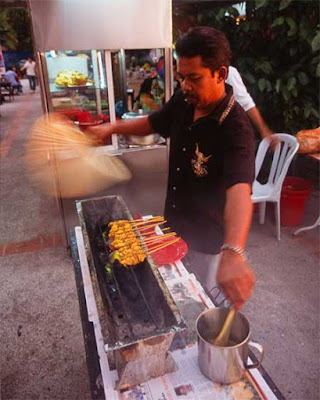 Back when in the Taiping, my dearest hometown, I remember that there used to THE famous place to get your satay, and it is a makeshift barbecue pit outside a restaurant with an Indian man beating his worn rattan fan profusely at his rows of delicious satay while rows of customers stare and wait. It was seriously that good. I vividly remembered the time when my dad swing by the place, parked nearby the stall, ask all of us to wait in the car, that’s mum, sis and me, and then went out with a huff like he is on an important mission. I would then stare out the car window longingly towards the thick cloud of gray smoke billowing from the stall, as I know that soon back home I will be able to tuck in to stick after stick after stick of juicy meat with bits of burnt crunches slathered liberally with sweet peanuty satay sauce. Ah, my dad indeed went on an important mission, a mission to fill his family with an amazing fare. By the time we got home we would all eagerly wait for my mum to unwrap the satays on the plate and the sauces into a bowl plus everything else and tuck in! I believe this is one of the best communing food you can find, everyone taking a stick and dipping into the same sauce again and again to scoop everything up; I believe we can truly only share with closed ones. Those were the days I remembered us sharing food together, me stacking a pile of sticks beside my plate and secretly proud of my achievements in quantity! In Malaysia, the Satay is like our ultimate meat on stick, inner juicy spiced meat with charred outside that are crunchy with smoky flavour that is oh so addictive. The best Satay is with the right combination of charred skin and juicy meat that are lean with a little bit of fat hidden here and there. Although for me secretly I would be removing the fats out, yes I know blasphemous for serious epicureans but bear with me as I have never really learn to appreciate squishy soft white ‘jelly’, but as I know from various epicureans, the fats are the binder of the meat and it is a must, so therefore I advocate it as such. Though mostly, mediocre satay may lean more towards the hard type due to lack of meat or over barbecuing, therefore do look out for good ones to truly appreciate Malaysian satay! In comparison to the satay I tried in Thailand, I found that our Malaysian satay had more charred outer layer and drier while the Thailand satay is actually more to lightly cooked meat on the barbecue pit, though lacking the important charred crunchy skin for me, I do enjoy it in some ways, but personally I like the Malaysian ones better! The next thing that will make or break a satay is definitely its peanut sauce! As mentioned before, satay is just not complete without its soul mate the peanut sauce. The sauce is made of chopped roasted peanuts in spicy concoction of chilli, loads of spices, soy sauce and tamarind; it is the perfect pair to our said satay. Coat the satay with the sauce and then chuck it into the mouth where you would be hit with spicy peanut sauce and then bite into the smoky charred skin which then would be greeted by juicy meat. Ah, bliss! Besides that, Malaysian satay would be served with several other optional assortments like sliced cucumbers, normally in triangle shape and slightly thick, onions also sliced thinly in bite sized, and sometimes even cubed ketupat rice. If you notice, all of these accompaniments are cut to just the right bite sized for us to use the remaining satay stick to poke into these lovely morsels to further wipe clean the satay sauce. Besides the satay, these are like the second best mate to the peanut sauce. Many Malaysians, especially the Klang Valley residences, vouch that Kajang satay is the best satay around. This unassuming small town that is just a few stones’ throw from the KL city is the humble originator of the biggest, juiciest yet still charred enoght satay! Besides, it is also notoriously famous for having many, many types of meat, ranging from the usual chicken and beef to rabbit and deer meat, one would start to see the possibilities of meat on stick! Of course the sauce has to be good enough to accompany all these simple and exotic meats. Though long time ago, I ate these indulging satay once right in Kajang itself and thoroughly enjoyed it, thereafter I no longer have to travel all the way to have it as the satay itself has expanded out to various major locations in Klang Valley! Yes, lucky us now, these restaurant totting names like “Kajang Satay” has sprouted around at various hotspots like mushrooms after the rain, so do look out for it and tuck into the array of satay when you chance upon it. There you have it, our Malaysian version of meat on stick, which I assure you, if not the best, it is definitely one of the best and definitely not to be missed if you come for a visit. After all, judging from my experience with Thai satay, I believe that our satay is unique on its own, and not to forget its unique soul mate the peanut sauce too. it just feel so right to indulge into stick after stick after stick of the delicious satay as it is healthy, tasty yet light on the wallet! Rokh is a food columnist on Malaysia Travel Guide, she’s an epicurean and a cook who loves to eat, also writes in her own food blog – Tham Jiak. In this column, she will bring you along while she explore various Malaysia foods, like what is good, what makes them so special and how or where to best well enjoy them.